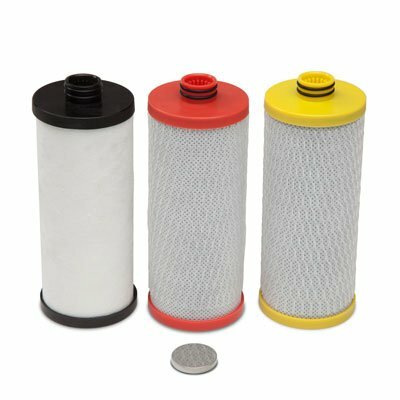 Replacement filters for the AQ-5300 3 Stage Water Filter System to be used with the following systems: AQ-5300.55, AQ-5300.56, and AQ-5300.62. Use only genuine Aquasana replacements with your Aquasana system - untested replacements are not certified for performance capacity or contaminant removal. Replacements are an easy twist - no need to disconnect hoses or water lines. Simply twist off the filter housing, replace the filter, and twist back on. Sediment pre-filter increases capacity and filters last for 600 gallons - healthy water that only costs you $0.09/gallon. Reduces up to 99% of 77 contaminants including lead, mercury, asbestos, pesticides, pharmaceuticals, chlorine, and chloramines. Full system certified to NSF standards 42, 53, 401, and P473. Claryum filtration technology filters out harmful contaminants while retaining natural, beneficial minerals for great tasting water. Use healthier water for coffee, tea, or smoothies and while you steam vegetables, boil pasta, or make soups. Even your pet can now benefit from chemical-free water! Replacements are an easy twist - no need to disconnect hoses or water lines. Simply twist off the filter housing, replace the filter, and twist back on. - no plumber necessary! If you have any questions about this product by Aquasana, contact us by completing and submitting the form below. If you are looking for a specif part number, please include it with your message.